If you work or study at the University of Warwick, get there with National Express Coventry! 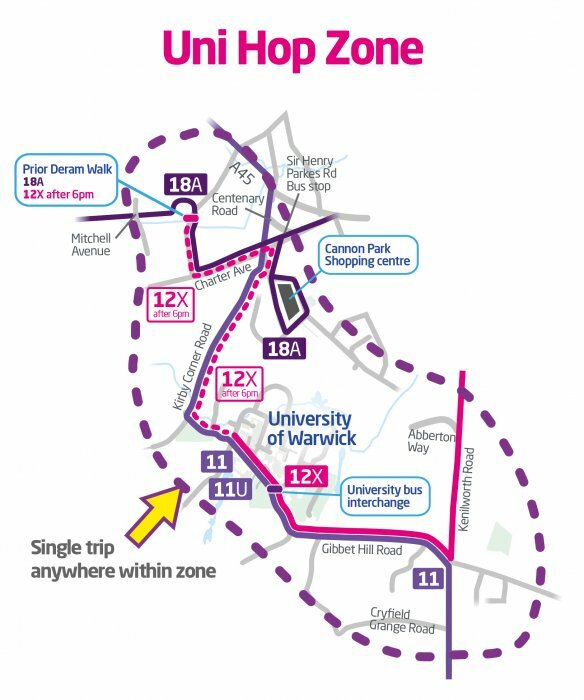 The 11, 11U & 12X services run to the University from Coventry bus and rail stations, with the 12X offering free WIFI and a fast direct service, with average journey times of just 15 minutes. The 11, 11U services also offer direct connections to the university from Earlsdon, Kenilworth and Leamington Spa. Available from Pool Meadow Bus Station (stand L), Cox Street (stops MB & MC), Much Park Street (stop KA) and St John's Street (stop JB). Journey times on the 11/11U are approx. 35 minutes, and 25 minutes on the 12X, with a combined frequency of up to every 7 minutes Mon-Sat, 15 minutes in the evenings and 20 minutes on Sundays. Available from Coventry Rail Station forecourt (stop ER3). Journey times on the 11/11U are approx. 25 minutes, and 15 minutes on the 12X, with a combined frequency of up to every 5 minutes Mon-Sat, 15 minutes in the evenings and 20 minutes on Sundays. Available from The City Arms. Journey times are approx. 15-20 minutes, with a combined frequency of up to every 6 minutes Mon-Sat, 15 minutes in the evenings and 30 minutes on Sundays. Available from Kenilworth (Clock). Journey times are approx. 15 minutes and runs up to every 15 minutes Mon-Sat, up to every 30 minutes evenings and Sundays. Available from High Street (stop 1), Pump Rooms (stop B), Parade (stop F) and Kenilworth Road. Journey times are approx. 30 minutes and runs up to every 15 minutes Mon-Sat, 30 minutes in the evenings and on Sundays. Get prepared for the start of term; view our autumn term timetables for the 11 / 11U and 12X, running from Sun 30th September 2018. Commuting from home or going to be catching the bus around the area? Then our Student Bus Pass is the one for you. Get unlimited travel on all National Express Coventry buses - including at weekends and in the evenings - available now for just £124.90 for the autumn term. If you'll be catching the bus a couple of times a week, then there are plenty of other ways to get you out and about for less. Did you know that all National Express Coventry buses accept contactless payments from cards and mobile devices, simply tap and go. You'll never be searching for change in the rain again! We also have our own mTicket app, meaning you can purchase our cheapest single and daysaver tickets before you even board the bus, just show the driver your ticket when get on! There's even the option to buy bulk m-tickets, and our great value group daysaver, perfect for those nights on the town with your friends. Travelling close to campus? With our Uni Hop ticket, staff and students can hop on the 11, 11U and 12X from stops within the Uni Hop travel zone for just a £1 cash fare per trip!